Left from the south end of Greensboro Bend on a narrow dirt road winding beside a rocky stream and climbing through a wild wooded country is STANNARD (alt.1700,pop 154), 3.3 m., named in honor of Civil War General George Stannard who turned the tide at Gettysburg. In this scattered rural settlement buried in a mountain wilderness farmers struggle to wrest a living from agricultural pursuits under adverse conditions. A white schoolhouse, and the tan and red Methodist Church and a farmstead are all that mark the center of this farming community. The region is wild and primitive in the extreme, vast forested uplands stretching away on all sides. 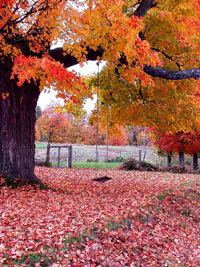 Many of the farmhouses are unacquainted with electric lights and other conveniences, and life here is in a crude stage. You still take the left from the south end of Greensboro Bend, up the narrow dirt road beside the rocky stream but today, life in Stannard, Vermont is a bit more comfortable than it was then when the WPA Writer’s Project penned that description. Stannard has no retail establishments, no paved roads and no air pollution. From places along the 18.5 miles of well-maintained dirt roads, one can see Jay Peak, in Orleans County, or Mt. Mansfield in Lamoille County. If you have a kayak on top of your car, you can experience the peace and quiet of Flagg Pond, and, if you are lucky, watch a moose eating along its shore, or listen to the resident loon laughing at you. If you have your binoculars, watch a Cedar Waxwing catapult after mayflies. In the center of Town still stands the tan and red Stannard Church, resurrected from years of neglect and now registered on the National Register of Historic Places. It’s Gothic, primitive interior is a peaceful, dignified place that hosts weddings, lectures and an annual December evening Christmas pageant. 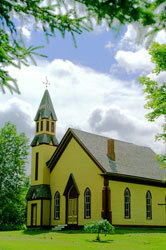 The Church, and the town hall across the road can be rented for your special event. In the Fall, drive up and over the Stannard Mountain road and witness one of the most spectacular Foliage drives in the county. In the winter, bring your snowshoes and from this same road hike to Stannard Pond. You may see moose track, bobcat track, white-tailed deer track or wild turkey track.